Sandy created a birthday card with a retired free digi. 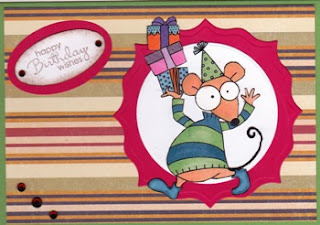 This cute card makes me smile! :) Thank you for sharing, Sandy! Here is a link to her blog post. Visit her blog and leave a lovely comment for her! Oh, Sandy's make is so fun and sweet!! Love it! Very sweet...I am a huge fan of yours and have used your images on some of my cards.the links are here.